Blogging is about communication. Some time ago I used the Word Press Jetpack statistics to check that one of the blogs I was writing had readers (Tropical Biodiversity) but recently the Word Press stats tools for blogs have gone through an impressive upgrade, offering levels of detail approaching Google analytics. I thought I might use these to look at the geographic distribution of the readership of three blogs I contribute to: Digitally Ready, Tropical Biodiversity, and Whiteknights biodiversity to explore their breadth of impact. Digitally Ready has a big audience in higher education and aims to showcase technology enhanced training. The user map shows the major access to come from the U.K. (7713 hits) with the USA (844), Australia (314), India (177) and Canada (158) in second to fifth place respectively. However the coverage is close to being a map of the countries with workable internet access. 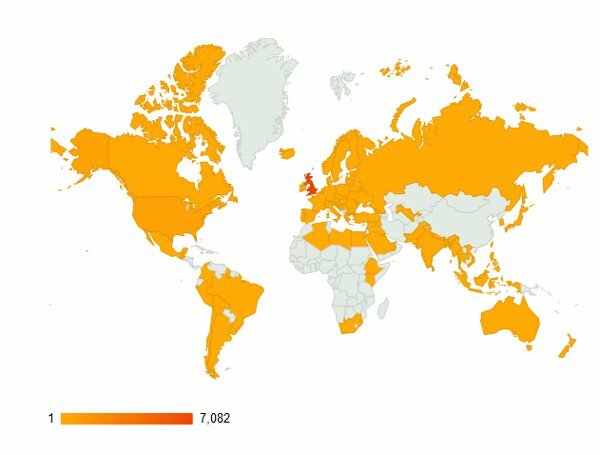 Readership map for the Digitally Ready blog. The Tropical Biodiversity blog is aimed at educating our students about tropical plants but also about allowing our students to write, and publish, literature and practical based research on tropical plants for others to read. Overall it has only half the total number of hits of the Digitally ready blog but also shows a different access profile. The UK remains the main user (2483 hits), followed by USA (610) , India (194), Australia (87) , Malaysia (85). Overall coverage is for a similar number of countries but with more penetration in central America and northern South America as well as tropical east Asia while the Digitally Ready blog has better coverage in northern Africa. Readership map for the Tropical Biodiversity blog. The third blog, Whiteknights biodiversity, aims to be of local interest and its target audience is users of Whiteknights campus who are interested in the wildlife and wildflowers. Logically its readership would be almost entirely in the UK with a few students accessing it when travelling. What is surprising is that, like the other blogs, it is read around the world. What is reassuring is that the audience has the highest proportional UK focus. The top country of access is the UK (7082 hits), followed by USA (559), India (145), Canada (121), France (103). What is more reassuring is that the audience is largely from temperate countries that share many of the species found here in Reading. 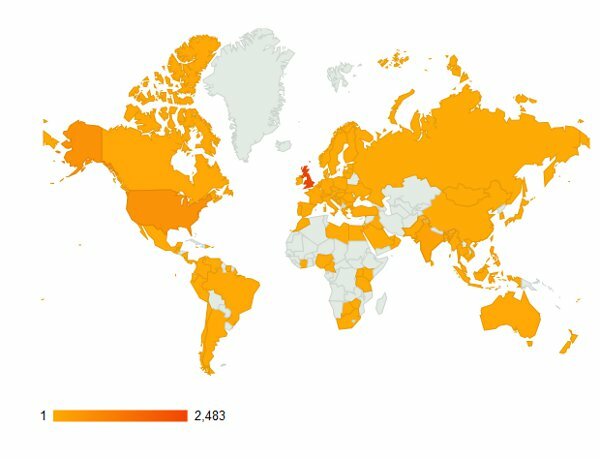 Readership map for the Whiteknights Biodiversity blog. Over the three blogs readers come from 140 different countries of which 20 are unique to Tropical Biodiversity, 15 unique to Digitally Ready, and 7 to Whiteknights Biodiversity. Reassuringly these unique countries have relevance to the blogs they target: St Kitts and Nevis, and Barbados are unique to Tropical Biodiversity while Uzbekistan and Moldova are unique to Whiteknights Biodiversity. It is less obvious why the Digitally Ready blog boasts unique visitors from Luxembourg and Albania. Why have I pulled these numbers from the WordPress Jetpack? Blogs are about disseminating ideas and information. Checking that dissemination is happening is essential. It fascinates me that these three blogs have been read in 140 of the 196 countries of the World. That makes the writing worthwhile. This entry was posted in Assessment & Feedback, Dissemination and tagged Alastair Culham, Jetpack, readership. Bookmark the permalink.